If I were to rank the questions I get asked by teachers most frequently, reading logs would be right at the top of the list. The topic of reading logs brings up strong opinions, both from teachers and parents. Educators whom I greatly admire have written posts questioning the authenticity of reading logs, rethinking reading logs as an at home assignment and alternatives to using a reading log. I agree with all they and others have written on this topic. I've used many of the ideas they mention in my own teaching practice. But before we "throw the baby out with the bath water", I would like to offer another perspective that I've been "writing" in the air of my thinking and conversations with others over the past few months. When I first started teaching fourth grade, I used a reading log for keeping students accountable for reading both inside and outside of school. Parents were asked to sign an at-home reading log to verify that their student actually did the reading. I even gave points that counted toward a reading grade. I cringe even as I type this! What I came to realize was that the voracious readers hated them. The striving readers didn’t fill them out. Parents signed them, often times on Friday morning while sitting in the drop off line. A parent signature didn’t always mean that the reading actually happened. I was always chasing the missing logs. But the thing I realized most was that I was sending a very unintended message that reading was a school job. As my understanding of best practice deepened and evolved, I reflected on this practice that, while well intended, was doing more harm than good. Readers who read for pleasure rarely, if ever, keep a daily, detailed account of their reading. Taking time to keep track of minutes or pages read did not encourage reading for enjoyment, nor was it improving reading skills. Rather, the opposite was happening. Reading was being viewed as a “chore”, something that was a school “job” and was devoid of enjoyment. To become a reader, you have to actually devote time to reading. I believe that it’s important that time for independent reading be provided both at school and at home. The most reliable data I could collect in regards to stamina, fluency, and reading growth was that which I could document while students were in school. The single greatest factor in reading achievement is reading volume (Krashen, 2004) so I needed to have some formative way of documenting students’ reading volume. When implemented as a way to ensure that students were reading at home, the mandatory, at-home reading log was not bringing the benefit initially expected. I stopped using an at-home reading log, instead focusing on the reading time I could control at school. Students still kept a record of the books they read during the school year, but rather than minutes and pages, they kept track of title, author, genre, start/end date, and a simple rating. The shift that made the most impact in the value of the record was that I devoted time for students to reflect on their reading record, guiding them to notice how they were growing as a reader, and helping them set goals that expand their reading repertoire. During small group work and conferring I would guide students to identify patterns in genres, formats, and authors they had read to help them see how they were expanding their reading lives. By always referring to them, students came to value them, keep them up to date, and use them for goal setting, pushing themselves to outgrow their selves as readers. In my role as a Literacy Strategist, my teachers have been grappling with the same questions and struggles in regard to the dreaded reading log. As I’ve talked about my own experience over the past few years, I’ve come to understand that what made the shift for me was my reflection on the purpose of asking readers to record what they were reading. These conversations brought me to the realization that there are actually two different ways of asking students to keep track of their reading, but each serves a different purpose. A reading log could be used in 1 to 2 week intervals at various points throughout the trimester for the purpose of assessing reading stamina. You might also consider a reading log at the beginning of a non-fiction unit of study, when stamina and volume are likely to decrease. The reading log allows for student reflection, analysis and goal setting. These logs would include students documenting pages & minutes read each day. A reading record would be used from the beginning of the school year (or beginning of new reading unit) for the purpose of documenting the books a student reads over the school year (or unit of study). A reading record is used for student reflection of authors and genres read, goal setting, and to assess volume. The reading record would include title, author, genre, rating scale, and date finished. Will you still need to remind students to keep their reading log or reading record up date? My first response is “Yes, you probably will.” But my second response is a question. You wouldn’t stop reminding a child to brush their teeth or wash their hands or any of another 1,000,000 things we remind children to do on daily simply because they have yet to “see the value” in doing those things, would you? I believe there is value to using these tools in the classroom. There are certainly digital options available for recording one's reading history. I have used them. But I would argue that those options are only viable if all students are provided access to them at school. When we keep "purpose" in mind, and use the things we are asking children to do in authentic ways, they will engage. The key to these particular tools becoming useful to readers is that they are referred to consistently, both by the teacher and with the student, as a tool for reflection and goal setting. What a thoughtful, insightful and helpful post! I love the way you discuss how your understanding of best practice deepend and evolved...this only happens when we actively seek ways to keep learning, growing, questioning, and connecting with others. As a teacher who saw first-hand how my students disliked the log and how "enforcing" it made me feel like the reading police, I love the idea of a reading record as a way to be proud of all the reading that is happening. My students use a paper record as well as Padlet to record their reading in a digital reading wall. I've asked you many questions about this idea through the years because I respect you thinking on this topic so much. I think the purposeful use of a reading log is okay when it is targeted and for a clear reason. I personally found a whole class reading log to feel very inauthentic and bothersome. Thank you for writing this post- I think it presents a clear and distinctive reason for both reading records, and sometimes, reading logs! Beautiful job. Kathleen I loved your reference to feeling like the "reading police". That really resonates with how I felt when I was using the traditional reading log. No one was happy! I agree with you that we have to always be seeking ways to out-grow our understanding. It's when we think we've "arrived" that we become stagnate. Thank you for always asking questions that push my thinking. That is definitely true of the conversations we've had via Voxer on this topic. I love being a thought partner with you. Susan, I am so with you! I made the exact same shift as you, from the dreaded reading logs to the reading record. I always work back from my end goal for my students. 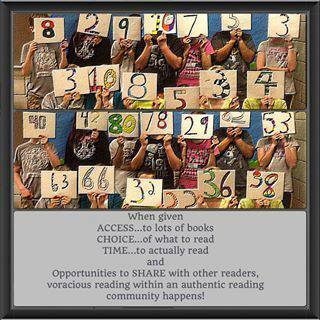 I always ask, "What is the most authentic way to engage in reading?" A reading record provides tons of information about my readers. Recording a book when the reader finishes it is a sense of accomplishment, a chance to add another book to their stack of steps toward growing as readers. Logs stunt our voracious readers, and are a roadblock and hurdle for our striving readers. My students love to record their finished books. It's a celebration, but it's also informative for me as the teacher. Great post! Yes! I know for myself as a reader, I find great enjoyment in updating the books I've read on Goodreads. I have seen the same sense of accomplishment in my students as they keep their own reading history. The pinnacle moment comes as they take time to look back over their records and see how they've changed as a reader. The big celebration at the end of the school year was always my favorite. It we never about how books they had read, though they had read a ton. It was about the new authors and genres and formats they had found along their journey.